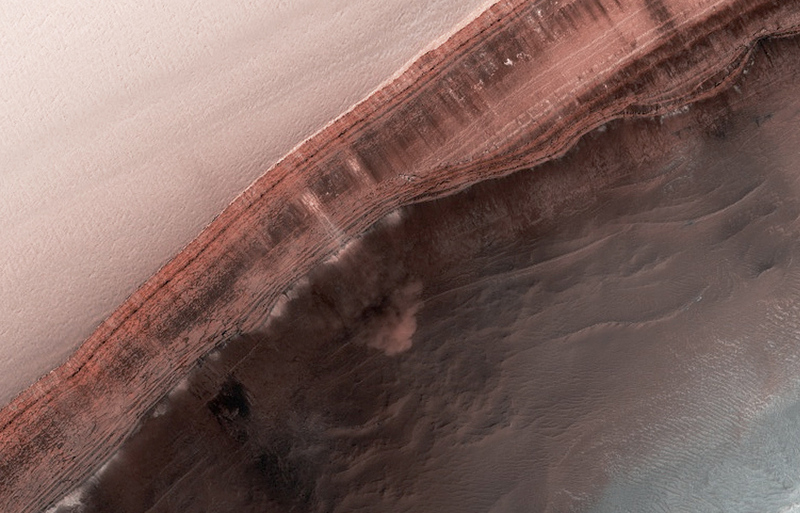 Martian Hazard #271: Falling Frost Avalanches! As spring comes to Mars’ north polar latitudes, the added sunlight warms layers of subsurface CO2 ice, which can rapidly sublimate and force its way outwards and upwards. When this occurs along the edges of steep scarps, as seen in the image above, the rapid expansion of the CO2 – literally ‘dry ice’ – can force ice, dust and soil off the cliff faces in avalanches that fall hundreds of feet to the base of the cliffs. These “avalanches” have been seen before on Mars, and they are another fantastic reminder that the Red Planet is still very much an active place! The image here is a section of a HiRISE scan (ESP_025010_2650) acquired on November 27, 2011 and included in the February 2012 PDS release. Over 400 new images of Mars were added to the Planetary Data System, enough awesome Martian geology pics to keep a desktop explorer entertained for quite some time! I’m going to work on a high-res version later today, using the full JP2 data. Watch my Twitter feed for updates. Image: NASA / JPL / University of Arizona. Edited by J. Major. UPDATE: See a high-resolution version of the avalanche above here. This photo is such a great moment for scientists and space lovers! Before finding life somewhere in space, a little bit of motion (even atsmospherical of geological) in another planet gives it some life! You have a really good blog, that I found when searching for good Mars pictures. I appreciate how you have a cover on all the different planets in your content. Keep the good work!